Pre School had been discussing healthy eating this week and the benefits it has on our body. They first of all started to put different food types into the correct groups. ie, vegetables, carbohydrates and protein and discussed which ones they already know they like to eat and what they think they should try next. 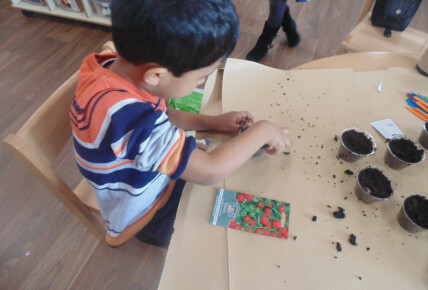 After much consideration and vegetables they wanted to try, they started to plant their own seeds to be able to grow their own so they can eventually try it. Growing the vegetables themselves, and taking care of its growth is something the children are looking forward to do before adding it to their yummy roast dinner or delicious salad. If you would like to be apart of these activities, please give Emma a call on 01332 518888.